Traditional gumbo is served over a bed of rice. 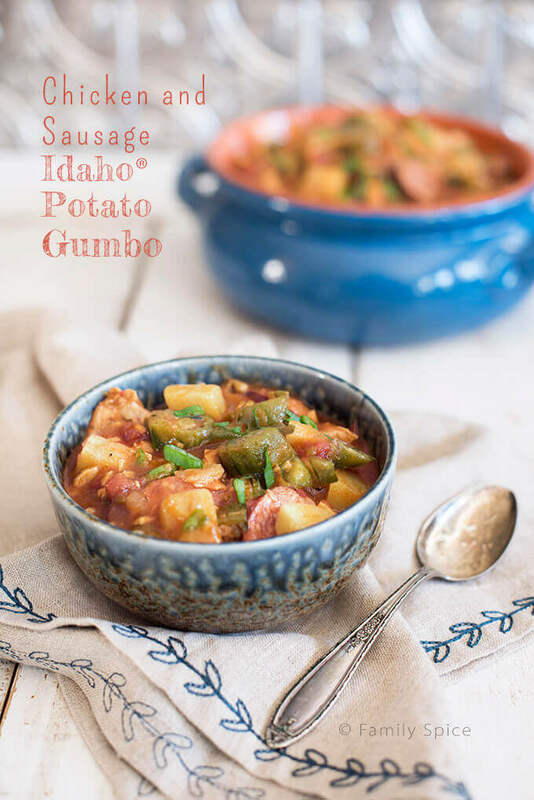 This Chicken and Sausage Idaho® Potato Gumbo, skips the rice and adds potato to make a thick and hearty soup. Sponsored by the Idaho Potato Commission. 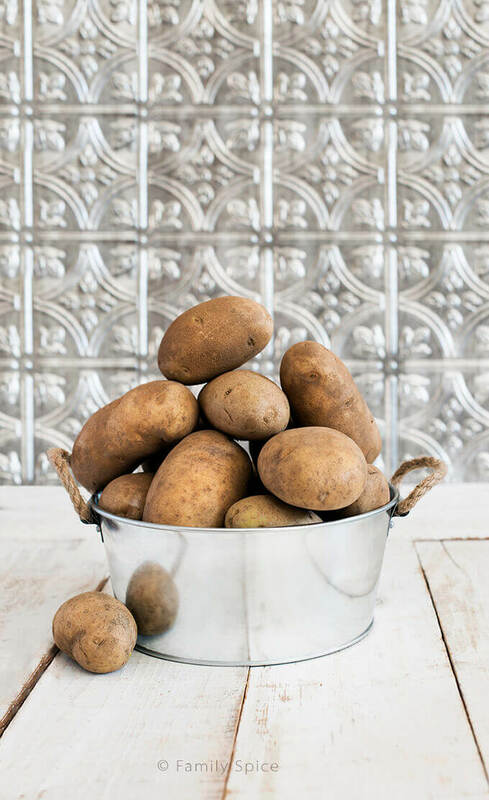 This is the second recipe that I am sharing with you for the promotion with the Idaho Potato Commission where I was asked to develop four recipes using a 10-pound bag of Idaho Potatoes that would feed a family of four for $25. Last week I shared my twist on two classic recipes: Chicken Pot Shepard’s Pie. Today I am adding a twist to another classic dish: gumbo! I am an oil brat. My parents both worked in the oil industry, and I was born in New Orleans. We only lived there my first four years of life, but for some odd reason, I wear that Cajun badge proudly. (I will always root for the New Orleans Saints, ya’ll). Now I grew up in Houston, Texas, but living off the Gulf Coast meant we had a plethora of cuisines to choose from. And since my mom was an avid cook, it’s not too surprising that shrimp scampi and etoufee often made an appearance at our family dinner table. But for gumbo, we relied on our dear Southern friends for this authentic meal. Traditionally gumbo is served with rice. It can be a soup or thick like a stew. While I researched more about gumbo, I found people are very passionate about their gumbo recipes and traditions, and conflicting opinions were everywhere. To add okra or not? To add tomatoes or not? Thicken with roux or with file? It goes on and on! After a few disappointing rounds with gumbo, I decided to add the flavors and ingredients that I wanted and add my own special touch. Instead of serving this chicken and sausage gumbo over rice, I decided it was better, healthier and more delicious with potatoes. Now of the four recipes I created using 10-lbs of potatoes and only spending $25, this potato gumbo is the priciest, costing $9.18. But, you are not skimping on flavor and you certainly aren’t going to leave hungry. This recipe actually makes 6-servings, not 4, and it’s stick-to-your-ribs kinda servings, too. The base of my potato gumbo is made with roux. I chose roux, because that’s how I was taught cajun cooking – it all begins with the roux. Now roux is typically equal parts flour and oil heated together to make a paste. You cook the paste over medium heat to the desired color you like. Some prefer a dark chocolate color roux, others prefer lighter. I made mine a caramel color because the darker roux made well, an unattractive looking potato gumbo. It also easy to burn the roux when you get to the darker color, and no one wants to taste that in their potato gumbo. 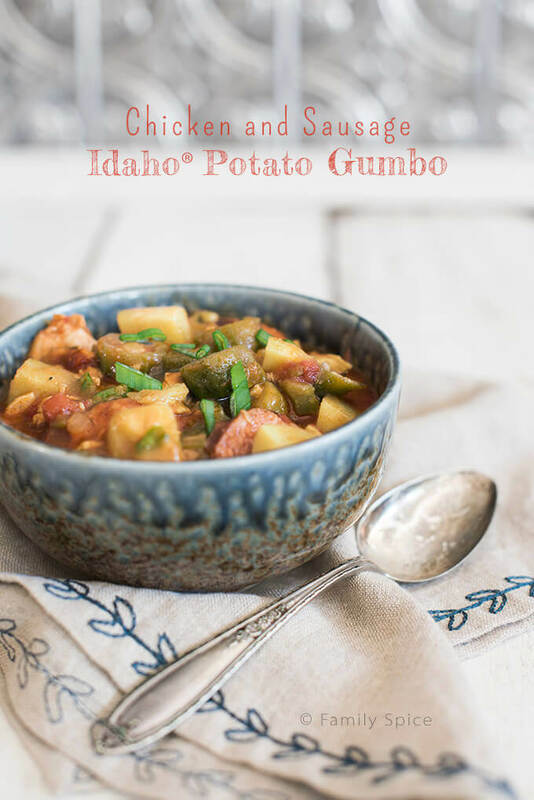 This potato gumbo is also the most time consuming dish I created in the 4/4/$25 promotion. But like most good soups and stews, the longer the potato gumbo cooks, the better and deeper the flavor. You can adjust the spice level to your preference, but I like a small bit of kick, nothing too overpowering – especially since my 13-year old son loves gumbo and I can’t make it too spicy for him. You can use fresh okra for this recipe, but I found frozen okra to be very affordable and priced less than fresh. Plus fresh okra is not always readily available in grocery stores. The most expensive ingredient I had in this recipe was the sausage. 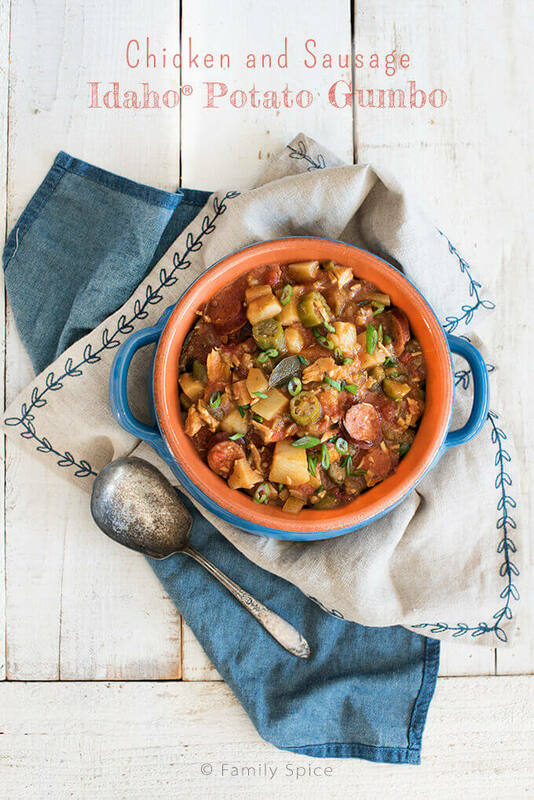 For gumbo, you want to choose an andouille sausage, which is a cajun sausage and is typically spicy. You can also use keilbasa, which is less expensive and not as spicy. So next time you have an envie (craving) for some gumbo, cher (dear), try something a little different. I know this potato gumbo isn’t authentic gumbo, but it’s my twist on the classic chicken and sausage gumbo. And it’s really delicious. Traditional gumbo is served over a bed of rice. 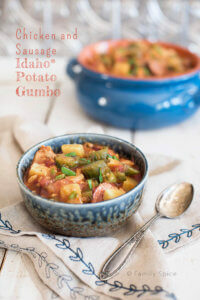 This Chicken and Sausage Idaho® Potato Gumbo, skips the rice and adds potato to make a thick and hearty soup. Transfer chicken to a bowl and reserve. Stir until a paste is formed and reduce heat to medium. Continue stirring and cooking until roux thickens and color is a dark caramel color, about 15-20 minutes. Scrape the browned bits off from the bottom of the pot. Raise heat to high and bring to a boil. Reduce heat to low, cover pot and cook for 1 hour. Cover pot and continue cooking for 30 minutes. Do not overcook okra or it will turn mushy. I’ve never made gumbo and this is the perfect place to start, thank you! 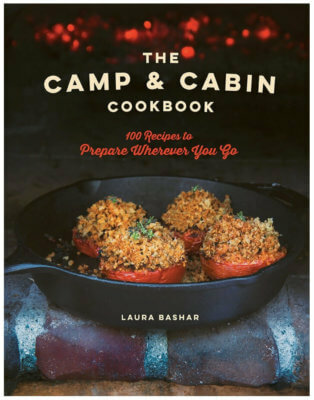 Loving these recipes with twists!! Potatoes are my most favourite thing in the world as they’re so versatile; this looks amazing!